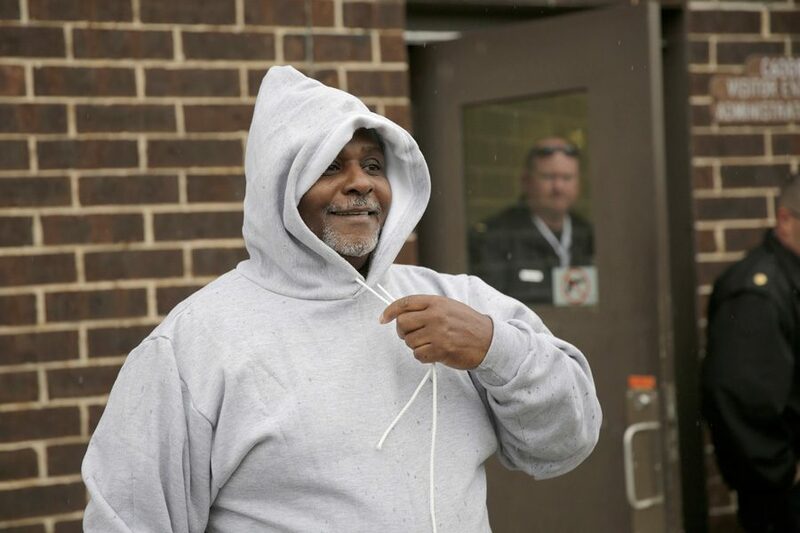 (Michael Tercha/Chicago Tribune/TNS) Alstory Simon talks to reporters as he is released from the Jacksonville Correctional Center in Jacksonville, Illinois, on Oct. 30, 2014. A Chicago federal judge dismissed a defamation counter lawsuit against Simon, stating the countersuit was not sufficiently relevant. A Chicago federal judge dismissed Tuesday a defamation countersuit filed in April by private investigator Paul Ciolino against Alstory Simon, ruling that it was too unrelated to the original suit for the court to exercise jurisdiction. Simon said Ciolino coerced him into making a false murder confession in 1999 after Northwestern’s then-Medill Innocence Project, since renamed the Medill Justice Project, helped free the man previously charged with the crime. Ciolino was involved with the Medill Innocence Project, which investigated wrongful conviction claims, in the late 1990s. The project contributed to the freeing of Anthony Porter — who had been convicted of two murders in Chicago — from prison after it obtained a video of Simon confessing to the homicides. Though Simon pleaded guilty in 1999, he was released in 2014 after prosecutors concluded his confession was coerced. Simon’s $40 million lawsuit — which was filed in 2015 against Ciolino, Northwestern University, Simon’s former attorney Jack Rimland and former NU Prof. David Protess, who founded the Medill Innocence Project — claimed the defendants had used illegal tactics to coerce his confession. Dow granted Simon’s request to dismiss the counterclaim Tuesday on jurisdictional grounds that the cases, while “technically related,” raise different legal and factual issues, according to court documents. He said Ciolino could bring his claims to Illinois state court. Ciolino argued that his counterclaim is valid under a federal rule of civil procedure, which defines a counterclaim as compulsory if it is logically related to the original claim and “arises out of the transaction or occurrence that is the subject matter of the opposing party’s claim,” according to court documents. Dow dismissed the claim of sufficient common ground between the two cases. “Although there obviously is some connection between Simon’s claim of malicious prosecution and Ciolino’s counterclaim alleging that Simon and the other Counter-Defendants defamed him by discussing Ciolino’s alleged conduct during the investigation, any logical relationship between the claims is attenuated at best and not sound enough…” Dow wrote in his decision. She also said she thinks Dow “wants to resolve this case sooner rather than later,” as continuing with the counterclaim would result in the discovery of further facts. Ciolino plans to bring his claims to state court and is also considering whether to appeal Dow’s decision on whether the counterclaim was a compulsory one, Bonjean said.